Really rough day at work yesterday, there have been lots of those in the past 8 months, but yesterday was an exceptionally rough one. Couldn't muster up a post. And dinner was a blur. Hopefully the rest of the week is a breeze, fingers crossed. Working from home today will help with that I think. Sometimes when I try to do the meal planning for the week, sit down and think about what we have, what sounds good and what we have going on for the week, it seems pretty straight forward. When the end of the week rolls around however, we rarely stick to the plan. Usually it is because of work and the fact that I don't get home in time to cook dinner or I just don't feel like it. I want to try to do a better job of actually sticking to it though, and I have been trying to go back and update our plans so that at least I do have a real record. Lets see how this week goes. Dinner - Maybe grab something with sister J on our way there I am altering this recipe a tad and using some leftover pork. We will see, its another experiment! Not sure yet if mom and dad are coming Saturday or Sunday, if they don't come Saturday then we will do pizza for dinner, if they come Sunday, we may just take them to Lord Fletchers for Brunch. 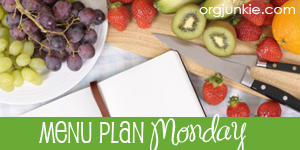 For more Meal Plans, check out Orgjunkie.